“Why can’t I point?” is a common refrain heard post-race at bars and yacht clubs around the world, and it’s a tricky question to answer. In the first installment of a four-part series on troubleshooting pointing issues, Quantum’s Dave Flynn starts with light air. 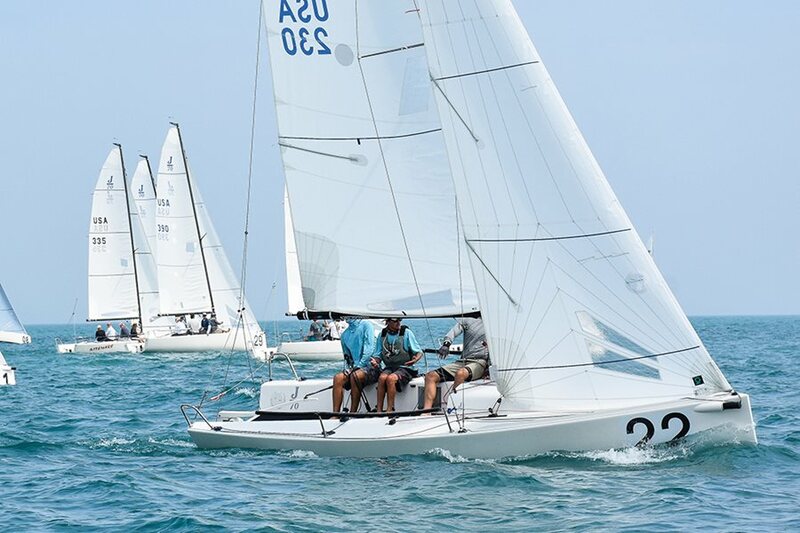 Proper Form - A J/70 team races at the 2018 Inshore Verve Cup Regatta. Photo by Sara Proctor. To help sort through the myriad of possible causes of poor upwind VMG, I will break the problem down into four conditions: light air, transition phase, optimum/medium, and heavy air. We’ll star with light air recommendations. I define light air as any condition where the crew is not hiking to weather. Actual velocity will vary as a function of boat design. The higher the horsepower-to-weight ratio, the quicker everyone is up on the rail. To use a golf analogy, in this range there are couple of key “swing” thoughts to keep in mind. If you sail a modern fractional rig with swept-back spreaders, you need to power up the rig. Increasing headstay length and easing tension on the uppers, lowers, and diagonals are key. In established one design classes, the exact numbers and proportions will be set out in well-researched tuning guides. For handicap boats, there may not be specific settings but the goals are the same: Generate headstay sag to power up the headsail, and create middle-mast sag to juice up the mainsail. You would like the headstay to sag just to the point of bouncing in the waves. An inch or two of leeward sag as you site up the mast is the goal. For boats with traditional masthead rigs with inline spreaders, you can still go for headstay sag by fully releasing the backstay, though you will need to be careful of loosening up the rig too much. On all boats, a little extra pre-bend is good so try moving the mast step aft slightly. You have to resist the temptation to point. This may be counterintuitive, but unless you get water flowing past the blades they are not going to work, and you’ll end up going sideways. Err on the side of “footing” or being on the low part of the groove with telltales streaming straight aft or even showing a little heavy on the bottom set. Use the middle telltales. It’s okay to steer to leeward; your weight will be better positioned and you can see the whole headsail. Steering to keep the telltales flying is important, but be careful not to chase. Small changes in wind speed (little puffs and lulls) will have a big impact on apparent wind angle. In a puff, the apparent wind will move aft and the telltales will tell you to come up. You can come up, but a better approach is to split the difference. Ease the headsail sheet to keep the telltales flowing, turning the puff into speed first, and then ever so gradually sneak the boat up, trimming slowly as you go. Don’t get greedy! If you come up too fast and overshoot, you will kill speed quickly and have to start all over again. In a lull, you will get a header, and the jib will show luff. Instead of bearing off, quickly over-trim for a moment and gradually bear off. As the boat slows, the apparent wind will go back aft and you will be able to ease and resume a normal setup. The trick is not to coast in the lulls and give up too much distance to leeward. Constant work with both trimmers minimizes the amount the driver has to steer. Straight, with a steady state and flow is goal.